The single lever Comet Florenz mixer tap, with ceramic cartridge and microswitch, is a superb quality tap with great style. Its overall height of 40mm makes it particularly suitable for many sinks with closing glass lids. Supplied with hose tails for easy connection. 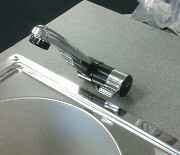 Silver coloured, single lever caravan mixer tap with plastic body. The Comet London Tap has a built-in micro-switch and can be used with both micro-switch and pressure-switch systems in caravans, motorhome and boats.